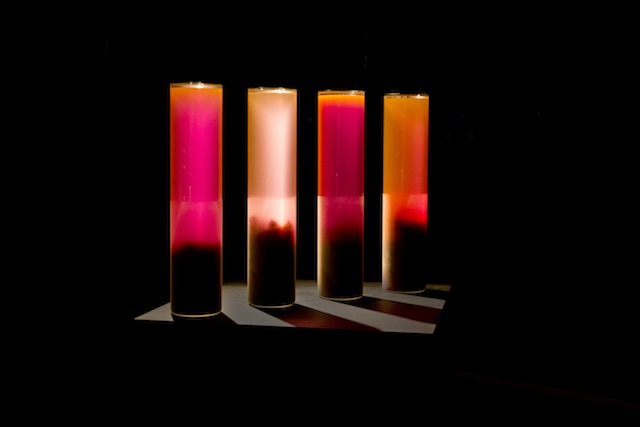 Art exhibit shows decaying, fluorescent algae #ArtTuesday « Adafruit Industries – Makers, hackers, artists, designers and engineers! After years of recreating or mimicking large-scale natural phenomena in restricted and controlled environments, Dutch artist Xandra van der Eijk instead decided to work with actual living matter. For her most recent work, Estuary, now on view at MU Artspace in Eindhoven, van der Eijk harvested four types of invasive saltwater algae present in the Dutch estuary Oosterschelde, which is famous for its storm surge barrier. She then placed these algae in containers that change colors in luminous fluorescent ways as the algae decays and microbes begin to thrive. Van der Eijk tells The Creators Project she first started using algae in the form of a gelatinous extract to thicken a fluid she used in her work Momentum. During the exhibition, which she toured around Europe, van der Eijk noticed that the algae extract showed inconsistent results due to the different sources and compounds of tap water found in different countries.